We know choosing a college is a big decision, and words and pictures can only tell you so much. That’s why we want you to visit us here at Hastings College and experience life as a student for yourself. We’d be thrilled to show you all Hastings has to offer because we’re proud of our school. Once you get here, we think you will be, too. There’s a lot to see and do on our campus, and we want to make sure you experience all you can when you’re here. This handy checklist will help you get the most out of your visit so you don’t miss a thing. Before you visit, explore this website and checkout our social media outlets. Look long and deep, and you’ll get a good overview of what Hastings College is about—and what you might want to see while you’re on campus. 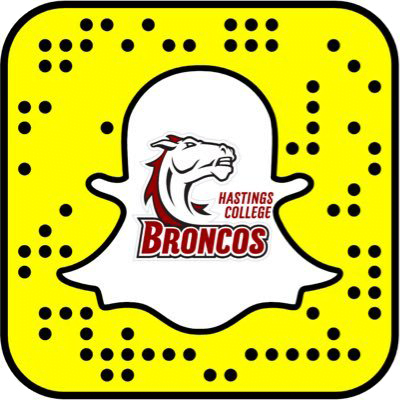 For social media, check out the Admissions Twitter, campus Twitter, Facebook, Instagram, YouTube and Snapchat (our snapcode). The people you’ll meet here are your greatest resource. Take advantage of it. Asking questions as you go is great, but it’s also helpful to prepare some beforehand so you don’t forget to hit on your important topics. Take an official campus tour. Think of your tour guide as your personal navigation system to all the campus highlights—your expert on all things Hastings. Explore campus on your own. Guided tours are helpful introductions, but exploring campus at your own pace is also valuable. Feel free to spend a little extra time checking out the things you want to investigate more closely. Let’s face it: After visiting more than one campus, sometimes details start to blend. Keeping a written and visual record of your visit and impressions will help you remember what you saw, where you saw it and why it’s important to you. They can tell you all about the admissions process and applying to Hastings, as well as give you information about financial aid and paying for college. There’s no better way to find out what it’s like to be a student at Hastings than to ask one. They’ll tell you what they like—and maybe even what they don’t—which will help you make a more informed decision. Sit in on a class that interests you and speak with the professor. Learn more about what you’d like to study in college, and meet the very people who will be teaching you. Eat like a college student and sample the local cuisine. Check out the posters and bulletin boards around campus. This will give you a good idea about the types of events and activities going on around campus at any given time. Pick up a copy of the student newspaper, the Collegian. It’s all produced by students, so the news stories and commentaries are a good way to see things from the student perspective. Explore the City of Hastings. There’s more to Hastings College than just the campus. There are also fun activities and attractions in the surrounding community. While you’re here, check out some local restaurants, tour area parks, browse the shops downtown and grab a cup of coffee at a local café.